(Nanowerk News) In addition to offering speed, accuracy, and a wide measurement range, mercury porosimetry also permits the calculation of numerous sample properties such as pore size distributions, total pore volume, total pore surface area, median pore diameter and sample densities (bulk and skeletal). 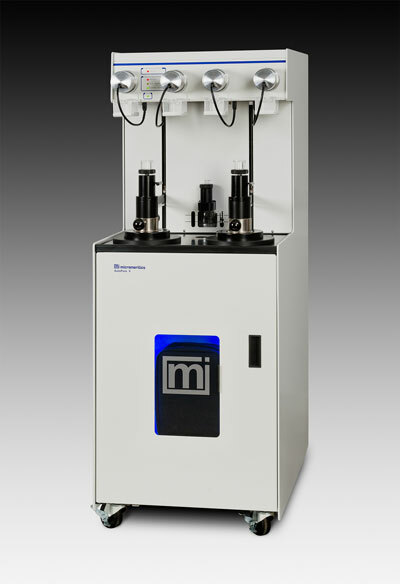 Micromeritics’ AutoPore V Series Mercury Porosimeters can determine a broader pore size distribution more quickly and accurately than other methods. These instruments also include enhanced safety features and offer new data reduction and reporting choices that provide more information about pore geometry and fluid transport characteristics. The AutoPore V is available in two models to best match the requirements of quality assurance and research labs. The AutoPore V 9620 has a pore size range of 500 to 0.003 micrometers with two high-pressure (60,000 psia maximum pressure) and four low-pressure analysis ports. The AutoPore V 9605 contains two high-pressure (33,000 psia maximum pressure) plus four low-pressure analysis ports measuring pore sizes from 500 down to 0.005 micrometers. The AutoPore V allows the development of a methodology that provides speed or precise detail. An equilibration mode delivers detail-rich, highly accurate measurements for in-depth porosity analysis. A scanning mode approximates equilibrium by increasing pressure continuously for a fast analysis. The AutoPore V establishes a new benchmark for operational safety with such features as mercury collection trays, a mercury temperature sensor, improved funnel and mercury reservoir design, triple fail safe penetrometer cap assembly, mercury vapor detection device, and a mercury vapor capture filter. MicroActive software greatly improves functionality, convenience, diagnostics, and data interpretation. Features include user-defined report and report options, automatic measurement of mercury temperature for accurate density calculations under operating conditions, and enhanced penetrometer calibration. A method wizard with an interactive step-by-step script eases method creation. A variety of available plots, post-analysis parameter change capability, and a diagnostic dashboard are also included. Overlay multiple porosimetry analyses with gas adsorption porosity data with a MicroActive import feature. Receive information on the distribution of pore shape with Reverberi method data reduction.